Over the last few decades, Brazil has confronted a number of major environmental challenges, such as the rapid deforestation of the Amazon. The survey finds that Brazilians overwhelmingly believe that protecting the environment should be a priority, even if it leads to slower economic growth or job loss. 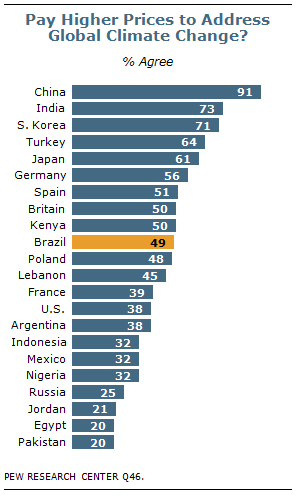 In addition, Brazilians are the most likely of the 22 publics included in the 2010 Pew Global Attitudes survey to see the problem of climate change as very serious. However, when it comes to personal choices, Brazilians are divided as to whether people should be willing to pay higher prices in order to address the issue of global climate change. Fully 95% of Brazilians agree that global climate change is a serious problem, including 85% who say it is very serious; a miniscule 1% say climate change is not a problem. By comparison, far fewer in the other Latin American countries surveyed express similar concern; 68% of Mexicans and 66% of Argentines see global climate change as a very serious problem. Concerns about climate change are also much higher in Brazil than in the other nations often referred to as the BRIC countries. About four-in-ten in China (41%) and Russia (43%), and 62% in India, say climate change is a very serious problem. Just 37% hold this view in the United States, which, along with China, emits more greenhouse gases than any other country in the world. While majorities of Brazilians among all demographic groups see global climate change as a very serious problem, there are some minor differences across educational and income levels; those in the highest income and educational categories are more likely to see climate change as a very serious problem. Less than eight-in-ten (78%) of those with a primary school education or less believe that climate change is a very serious problem, while 86% of those with secondary education and 94% of those with a college education say this is so. Similarly, views on this issue are correlated with income, as those in the high income category are the most concerned, followed by middle income respondents. 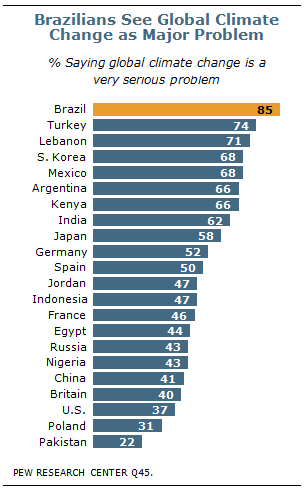 Brazilians in the low income group are the least likely to rate climate change a very serious problem. When asked whether protecting the environment should be given priority, even if it causes slower economic growth and some loss of jobs, a full eight-in-ten Brazilians agree; only 17% disagree. Brazilians are among the most likely to give the environment a higher priority; only in India (86%) and South Korea (82%) do more say that protecting the environment should take precedence over economic growth. Eight-in-ten in China, the same percentage as in Brazil, share this opinion. 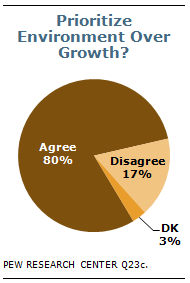 More people with a college education (93%) completely or mostly agree with giving the environment priority over economic growth than those with a secondary or a primary education (81% and 74%, respectively). While Brazilians express serious concerns about global climate change and see protecting the environment as a priority, a much smaller number (49%) agree that people should be willing to pay higher prices in order to address global climate change, while nearly the same percentage disagrees (45%). On this question, Brazil is near the middle of the global pack, ranking 10th among the 22 nations surveyed in terms of willingness to pay higher prices. Those in China and India are the most willing to pay more in order to cope with climate change (91% and 73%, respectively). Publics in the two other Latin American countries polled are less likely than Brazilians to say they would be willing to pay more; 38% in Argentina and 32% in Mexico say that is the case. About six-in-ten Brazilians with some college or more (59%) think that people should pay more to address climate change, while only 48% with some secondary and 46% with a primary education or less agree. Similarly, 62% of high income respondents agree that people should be willing to pay higher prices, while only 47% and 46% of middle and low income groups, respectively, concur. Even among Brazilians who say climate change is a very serious problem, only 52% agree that people should be willing to pay more to address climate change, while more than four-in-ten (43%) disagree. Likewise, 52% of those who say that protecting the environment should be given priority over economic growth are willing to pay higher prices, while 44% are not.